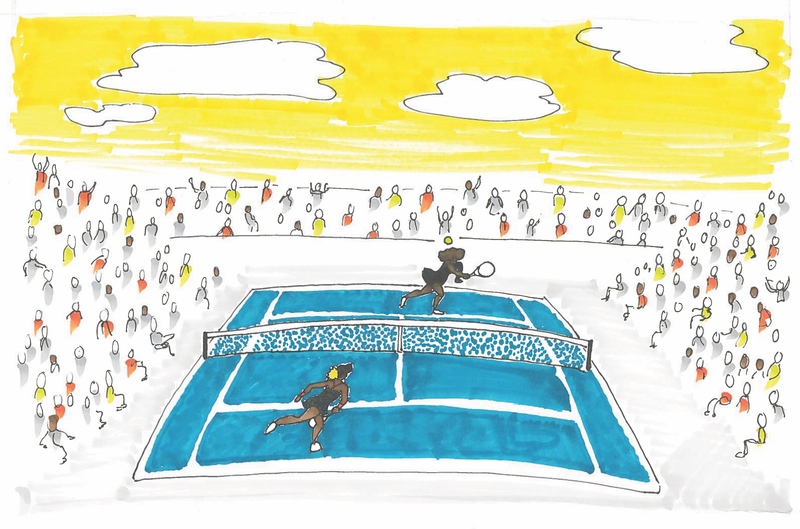 On September 8 2018, the women’s singles US Open final was marred with controversy as Serena Williams lost the game in a stunning upset to Naomi Osaka. No matter the outcome, the result would have been historic. Osaka won in straight sets, 6-2 6-4, becoming the first Japanese woman to win a Grand Slam. Had Williams won, she would have tied for the most women’s singles championship wins ever, at 24 wins. By the middle of the second set, Williams was ahead 3-1, but Osaka broke her serve, narrowing the gap between the two players. In a moment of frustration, Williams threw her racquet on the ground, breaking it, and incurring a second code violation. This was a clear racquet abuse violation, and as with any second code violation, Osaka was given a point. Now the game was 3-2 with Osaka leading 15-0 in the game. Again, Williams argued with the umpire and said that he should apologize for the coaching violation and make an announcement to the crowd that she had not been receiving coaching. Here, she famously called Ramos a “thief ” and a “liar.” For this, Ramos issued a third code violation for verbal abuse and the game was given to Osaka. It was only after Williams returned to the baseline that she was made aware of the fact that Osaka had been given a game due to the third code violation. In a moment of peak athleticism and sportsmanship, Osaka won the match by holding her serve. The two passed each other and hugged, acknowledging each others’ hard work. As the trophy ceremony began, fans booed, and while Osaka cried, Williams put her arm around her. Serena Williams and her sister Venus are well-known for breaking boundaries when it comes to the conservative nature of tennis. From the start of her career 20 years ago, the cornrows in their hair were considered “controversial.” Even recently, at this year’s French Open, the president of the French Tennis Association was upset by Serena Williams’ form-fitting catsuit and banned it, arguing that “[Williams has] to respect the game and the place.” Williams insisted on wearing the catsuit because it helped her prevent postpartum blood clots. This decision is yet another example of the pervading sexism in the tennis world. Furthermore, Williams undergoes twice as many drug tests as other players on the circuit. There has been a lot of debate around the result of this game, creating two very polarized views about the outcome. People either believe that Serena was “acting like a brat” or that Ramos’ decisions were rooted in sexism. However, the results of this match are tied to much deeper and more complex issues. Ramos is a respected and knowledgeable umpire, but he is also known for being tough. In an interview after the match, Ramos stated, “I’m fine given the circumstances […] It’s a delicate situation, but ‘a la carte’ arbitration does not exist.” However, last year at the French Open, he called a questionable penalty for a time delay against Rafael Nadal. Nadal responded by telling him that he would make sure that Ramos never refereed one of his games again. Despite that threat being much more severe than anything Serena said, Nadal did not receive a penalty. Misogynoir (sexism specifically directed towards Black women) has been constructed historically through representations of Black women as loud, dominant, and verbally abusive. Most media coverage of Ramos focus on the sexism behind his calls, but not many have emphasized the ways in which that sexism intersected with Williams being black. Misogynoir (sexism specifically directed towards Black women) has been constructed historically through representations of Black women as loud, dominant, and verbally abusive. The “angry Black woman” trope grew into what is now the clear discomfort with and discouragement of women of colour showing their emotions when they are anything other than happy. That misogynoir sentiment is best exemplified by Mark Knight’s cartoon in the Herald Sun. In it, Serena’s face is distorted, her expression of anger exaggerated. She’s shown as brutal and aggressive, in contrast to a calm white woman in the background — a misrepresentation of Osaka, a woman of Japanese-Haitian heritage. A pacifier at Williams’ feet and the umpire’s infantilising remark “can you just let her win?” all convey the idea that she is throwing a tantrum. His piece is a good reminder of the fact that there is still a distinct lack of empathy and understanding offered towards women of colour when they express anger at the many injustices they experience. As the pioneer that she is, Williams stated in a post-match conference, “I’m here to fight for women’s rights and women’s equality. The fact that I have to go through this is an example […] Maybe it didn’t work out for me, but it’s going to work out for the next person.” Williams’ strength is not something to be feared, but something to be revered.